Story is based on actual events. Names have been changed to protect the identity of the victims. Lepper retreated to the living room. Ike came downstairs and looked into the living room where Lepper was. "She just got sick," he said blandly. I jumped out of my chair in the kitchen and ran for the living room. "OH GOLLY" I said (yep, that's what I said). I ran downstairs and quickly refilled the light blue, plastic bucket with water and vinegar. I went back upstairs to the living room and began to clean up the vomit that was sitting on the living room carpet. It didn't smell like vomit. It smelled like skunk. The skunk had sprayed Lepper in her mouth. That's a smell that I can't begin to describe. It's like no smell that I have ever smelled. Nothing compares. I had to get it out of the carpet. I frantically scrubbed the carpet. It's now 5:30 AM. I clean the carpet as best I can and douse it with baking soda. I need to get ready for work. I jump in the shower. The smell on my body is awful. Nothing but skunk. I try to scrub it off. I try to wash out my nose. Nothing is working. 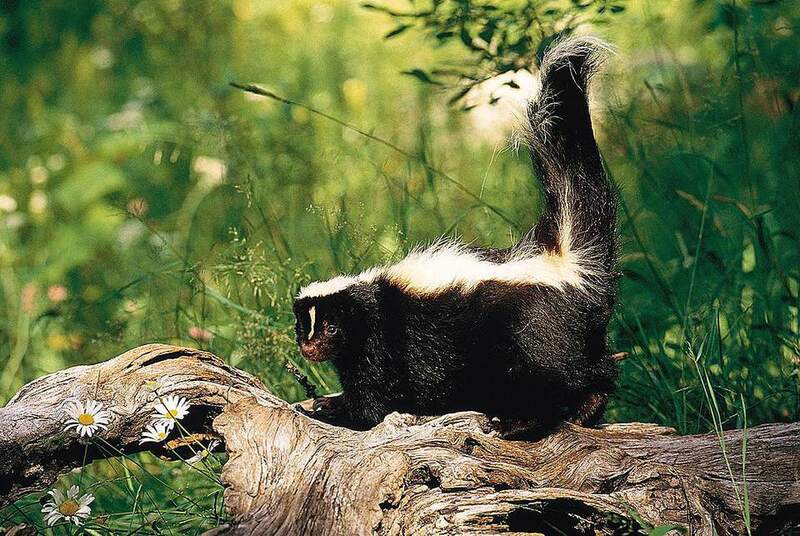 I still smell skunk. There is nothing else that I can do at home. As I get ready to leave for work, my daughters come downstairs with disgusted looks on their faces. The smell has awakened them. I tell them what happened. They're in shock. They're worried about Lepper. I tell them that Lepper is okay, but the house stinks. I can't do anything more. I go to work. I feel badly that I have to leave them behind. While at work, I email my mother-in-law and tell her the story. She emails back and tells me that my sister-in-law has a sure-fire recipe for de-skunking the dog. GREAT! I fire off an email to my sister-in law, "Rory Eyesucker," pleading for the secret recipe. Thankfully, she emails back with the ingredients that are sure to take the skunk smell off of Lepper. She is very sympathetic. She knows all too well the smell that I have described. Her dog, "Juicy," has been sprayed several times. Mix all ingredients in large container, coat dog with the foam. She also recommended that I spray the affected carpet and other areas with vinegar for a few days. I thank my sister-in-law for the recipe, then get to work on my shopping list. I wonder about my shopping list. I wonder if anyone will question my supplies of hydrogen peroxide, charcoal, baking soda, aluminum pie plates, vinegar, Dawn liquid dish soap and Febreeze. I feel like I am about to purchase supplies to build a destructive device. That the FBI is going to arrest me. Oh well. We'll see what happens. I get all of the supplies and ingredients at the store then go home. The temperature outside is nearing 100 degrees. The van is hot. I have to get out of here before the FBI comes after me. I open the garage door, pull the van into the garage and immediately, I'm hit by the smell of skunk. IN THE GARAGE! I'm not even in the house yet. I open the kitchen door off of the garage. HOLY CRAP! The house smells worse than it did this morning. My girls can't stand the smell anymore. They plead with me to let them go to the neighbor's house. I tell them to go. They race out the door, practically knocking each other down as they run. They've ditched me. I'm left alone with Lepper. I get to work.